Before Godzone this year, I wrote a little blog. As a team, we were totally overwhelmed with the response from our friends and family, and thus I’m somewhat inspired to follow it up with how the race unfolded for us. It is humbling to have so much support and we definitely felt it out there in the field. Pre-race, I said that I thought we could get top 10 if we had a good race. Race director Warren Bates had put us in the top 10. We finished 11th. Do I think we had a good race? Yes. Am I disappointed with 11th? Not really. Do I think we could go better? Absolutely. Historically, I am not particularly a ‘girly girl’. 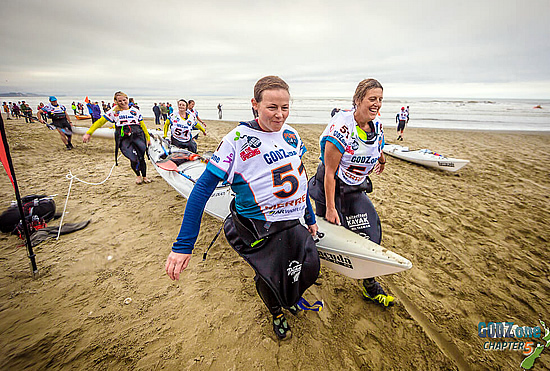 I wasn’t even particularly excited about the prospect of my first Spring Challenge, though I’ve subsequently come to love the race and this potentially opened my eyes to racing in an all-female team. For me this has never been about beating the boys, or ‘girl power’. It’s been more a matter of wanting a new challenge and up-skilling. I can honestly say, that I think I had the most fun I’ve ever had in an expedition race this time around. Most likely in large part due to the fact there were no expectations and no pressure, but also, undoubtedly due to the fabulous company I had in my 3 team mates. Stage One- Coasteering and Kayak. Kaiteriteri to Rabbit island. The start of these races are always a bit tiresome. So many teams punching above their weight and sprinting off the start line to fight for seconds. It’s all a bit ridiculous really. We agreed to stay well within our limits and definitely stay conservative on the swim stage. I’m not really a fan of swimming in adventure races. It’s one thing swimming in a triathlon, but it’s another when you’re wearing shoes and a baggy race bib with a clip card around your neck and a GPS tracker stuffed down the back of a wetsuit. I can’t say any of us particularly enjoyed the swimming, as it was more treading water to avoid getting kicked in the face by the other average swimmers that adventure racing attracts. Anyway, moan over. Once we were out of the water, trotting around the coast was fun and watching some reasonable waves crashing on the rocks exciting. It was a bit scary watching people dive head first into water where there was no visibility and numerous boulders just under the surface, as one guy in front of me found out the hard way, ploughing himself face first onto a rock submerged about 10cm below the surface. As I said, people do dumb things at the start of a race. The kayaks were a welcome sight, sort of. Due to there being too many teams for kayaks, each team was given one of the lovely Barracuda sea kayaks, which are a pleasure to paddle, and one heavy yellow kayak more akin to a barge. Fleur and I definitely drew the short straw here and ended up stuck in this pig of a boat. As we were crawling our way to Rabbit Island we both agreed that we had never been passed by so many people in a kayak stage before. It was amusingly demoralising. However we kept reassuring ourselves that things would just get better from here. As we neared Rabbit Island we could see teams loitering out the back of the surf, and certainly there seemed to be some decent waves crashing on the beach. As we neared, sure enough there were people scattered through the breakers with boats bobbing around all over the show. Fleur and I picked our wave, and then went for it. We absolutely nailed the landing and cruised up the beach perfectly. La and Em also surfed in unscathed. To say I was happy was an understatement. I declared then and there that it didn’t matter what happened in the rest of the race. Job done. See you later swimmers. Into the TA and we changed mode a bit from settling in, to getting down to business. I suspect we passed a number of teams in TA. There were a lot of people out in support at Rabbit Island which was awesome, but not so cool when you’re trying to pull on bike shorts onto a wet bottom. Stage 2 –Rabbit Island Mountain Bike Orienteering and Mountain Bike Richmond Ranges. For the MTBO we were allowed to split into 2 pairs. La and I set off just ahead of Fleur and Em. La picked up all the controls seamlessly. I was just tagging along eating and drinking and throwing in the odd word of support. Shortly later, we came to the final corner at exactly the same time as Fleur and Em. It was uncanny timing, and we rolled into the clipcard checking station together. From here, we headed out on the Great Taste Trail towards Richmond and the Barnicoat range. The highlight of this stage was the people. There were so many people out in support on the cycle way and all the way up into the Richmond hills. It was so inspiring and energising. Hundreds of people clapping and cheering and kids giving us high fives. I suspect it had a bit to do with Mr McCaw being in town that day too, but we lapped it up. Once into the trails proper, things quietened down, it got dark and our forestry road on the Barnicoat range came to an abrupt end. All rather disappointing things really. La was certain that the map was matching the overgrown trail that continued ahead, so we pushed on through gorse and blackberry. We persevered and eventually popped out on to a really good road. La was busy apologising for the route choice as we turned onto the main road just in front of a group of teams who had been ahead of us at the start of the descent. Not too shabby after all. We were pleased to be through that confusing forestry, when shortly later, we found ourselves in another mess of roads. There were a few teams about, all a bit perplexed. We pushed on, biking up a road that seemed to be doing what it should on the map, but La and Em were a bit ruffled when more teams started coming back out. Including that of their orienteering buddy, Georgia Whitla who rode past, commenting that things were ‘mysterious’ which Fleur and I learned is Orienterring-lingo for ‘This situation is SERIOUS. The road is not doing what it should on the map’. We spent a bit of time making sure we were where we thought we were, and then pushed on up the unpopular road. Some solid hike-a-bike later, up steep hills and through yet more gorse, we popped out onto a forestry road that wasn’t so ‘mysterious’ and led us into the TA as midnight loomed. This stage definitely set us up for an inherent distrust of forestry roads. We left onto this stage in good spirits, and happy to be walking at night. We all agreed it made it much easier to talk. Up onto the Ben Nevis ridge we made good time, as we got higher, the weather became worse, until we couldn’t see 20m in front of us. We all had every item of compulsory gear on and were just warm enough as long as we were moving. There were a few teams about, and La did an excellent job of navigating with zero visibility in the dark. We were nearly over the hardest bit of the trek clambering around loose rocks as the sun came up and had all relaxed a little bit, just long enough to lose focus, and head off in the wrong direction on the ridge looking for the CP. The CP was on a mountain that was over 1800m high. Much higher than anything else in the range, but we couldn’t see a thing. The tops were so clagged in, we could only see the next wee rise in front of us. We became quite disorientated at one point. We thought we had to be standing on the high point, but according to our altimeters we were only at 1720m. We spent about an hour trying to relocate on the map and huddling behind rocks from the freezing gale winds. By now, we had decided to backtrack to our last known point on the map. Fortunately, we bumped into teams ‘Old and Slow’ and ‘Cloud Base9’. A little bit of chinwag with these guys and we were back on our way. The problem was is that we were just travelling much slower than we’d estimated on the big loose rocks in the icy winds and we hadn’t gone far enough. We were quite relieved to see the chaps at the manned CP on top of Red Hill. They were in surprisingly good spirits in spite of their exposed campsite. But perhaps slightly concerned that they were about to run out of whiskey and we were only the 11th team through. From here, we dropped down into the right branch of the Motueka river and had to make our way to Beeby’s hut. The girls had mapped the route they thought looked best and had asked Chris before the start which way he was going. He had intended to go the same way, and had heard that there may have been a track from Red Hills hut to Beeby’s hut. So we followed the creek out for a way, then up onto The Plateau. It looked like ideal travel on the map. We had images of a big soft, grassy meadow. It was actually a rocky swamp where the grass is just long enough to hide the rocks so you can’t really anticipate what lies beneath. Emily was most disgusted by the up-hill swamp. It’s one thing having a bog to wade through, but it’s another when it’s up hill. We finally made it down to Red Hills hut and were pleased that the weather seemed to be improving a little. From Red Hills hut, we came across a track. Not just a blazed overgrown trail that we’d hoped for, but a proper trail. It looked perfect for a mountain bike. Especially after we’d been walking for more than 20hrs by this stage. Remarkably, this trail followed the exact line that Em and La had marked on their maps for us to bush bash through the beech forest. We couldn’t quite believe our luck and I felt almost guilty strolling along this amazing trail. It did seem odd that it wasn’t marked on the map at all. As we popped out near Beeby’s knob, we had a short out and back to get the CP at Beeby’s hut. It was on this that we saw about 4 other teams. It was really exciting seeing how close everyone was. From here, there was just a painful 5km or so down hill on a gravel road to the TA. We felt we had been fairly consistent through this stage with significant weather and navigation challenges thrown in, but we all agreed it was time for a rest. So with the prospect of a 3 hour sleep on the cards, we came into the TA feeling in good spirits. Stage 4-Mountain Bike and Orienteering. Tophouse to Lake Rotoroa. We had a lovely greeting from my parents here. I think Mum had been worried about us girls walking around outside in the dark. Very dangerous. 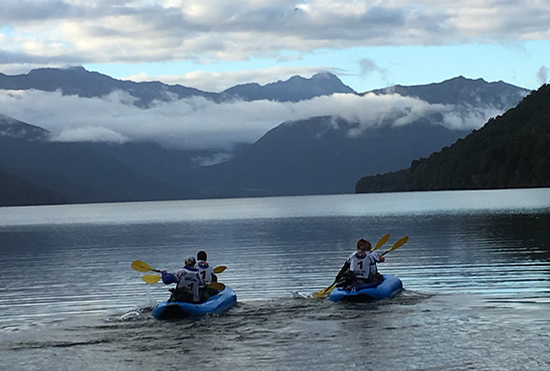 We had a really efficient TA and then biked off toward Lake Rotoiti with the plan to sleep before the Orienteering. La had suggested we clip the start of the Ori first, but I didn’t want her time to look terrible because we stopped for a sleep. So we pitched the tent. No sooner had we got the tent up and started to get ready in our sleeping bags, than the Bivouac Colts wandered right past. La checked the map, and sure enough, we’d put our tent up right smack bang in the middle of the Ori course. I decided it wouldn’t matter because once asleep we surely wouldn’t hear people. That was a bit of a mistake. One team thought we were the start of the Orienteering, and had a very loud team discussion about how odd it were that there was no-one manning the start, and if they needed their compulsory gear, as clearly this team had left theirs behind. At 3am after only an hours sleep in the last 36 hours, my fuse is a little bit shorter than it typically is. I still don’t know which team it was, but after some Class-C profanities, they did leave in a hurry. The orienteering was boring. 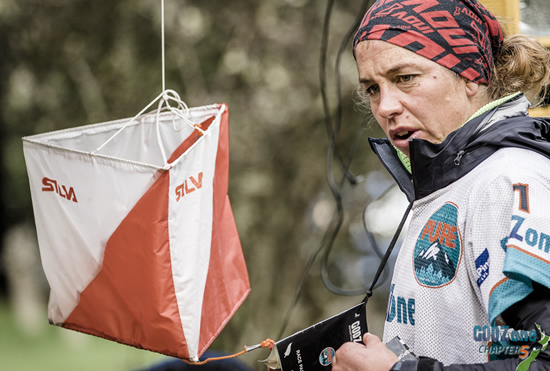 Orienteering is an individual sport; I have never found it fun in an adventure race. It is marginal when you get to split into pairs, but when there are 3 people following one person around in circles looking for boulders or for a re-entry, it’s just plain tedious. After La clocked the second fastest time of the race, in the dark, we were off on bikes again for what became a really pleasant ride to Lake Rotoroa. The Porika track was very scenic and topped off with a road-side stand of hot chocolates and home baked biscuits. What a treat! We rode into the next TA as the sun came up and the sand-flies appeared in force. Stage 5-Kayak-Trek. Lake Rotoroa/Mole Tops. 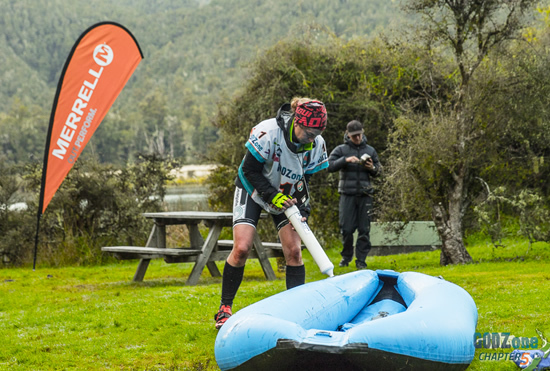 This stage was kicked off with a paddle across Lake Rotoroa in double inflatable kayaks. We knew it was going to be slow going, and it was even worse than what we’d imagined. It was just fortunate there was no wind, as I suspect we would have gone backwards. Team GaryAnderson spent about 15minutes passing us. They barely looked like they were moving, I pointed out to the girls how slow they were going, and that we were clearly going slower as we were being overtaken. It became so ridiculous it was hilarious. We were in fits of laughter, and as if we hadn’t been going slow enough already, we came to a stop as we laughed too much to even paddle. Getting to the end of the paddle, we were treated to hot coffee and a hot meal that was provided by Absolute Wilderness at Durville Hut. It certainly put us in good spirits as we headed off up on to the Mole Tops. This stage was one of my favourite parts of the race. It was fun to be hiking off trail through the beech, and once on to the tops, the view of where we’d been and where we were going was spectacular. After having had our feet bashed around on the rocks of Red Hill, the surface was soft and pleasant under foot. There were numerous tarns and we could see the bad weather rolling in, but were confident we had lots of spare warm clothes, and what’s more, we were heading into the dark zone so were about to get a big sleep. We were all pretty happy. I am familiar with a large section of the Matakitaki river and knew the rest of it was pretty straight forward until the ‘Lowers’ section which is home to some Class 3+/4 rapids. We had agreed to get out and scout these rapids, but they snuck up on us and so we didn’t have the option. It was a little bit stressful, but I saw a couple of familiar faces doing safety on the river and figured it would be sweet. It was. Before the race, we had identified that the canoe paddling would likely be an area of weakness for us. We knew there was going to be some Class 3+ rapids as the newsletters had said so. We put a significant amount of effort into up-skilling over summer. 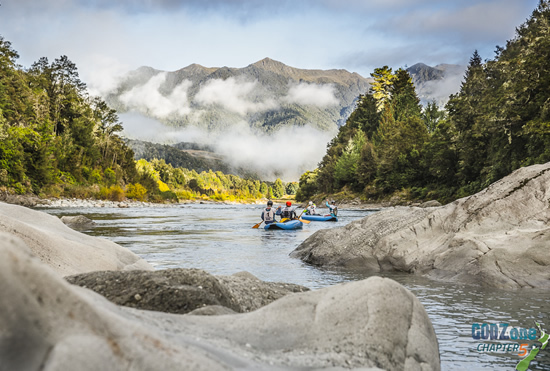 We spent a day on the Arahura River in Hokitika getting some tuition and basic safety skills. This certainly paid off, as we were more confident getting on the river, and we bounced down without a hitch. It was a good feeling. The sun was shining and we had made excellent time down the river. We’d lost quite a lot of time on the 2 compulsory portages, but I guess that’s to be expected. The best bit was we were now in Murchison and it was time for a coffee. Stage 6+ -Murchison tea rooms. 2 pies, 4 coffees, 1 sausage roll, 1 carrot cake, 1 quiche, 1 bag of chips. Oh Ye-ah. Stage 7- Mtb to Mt Owen. This stage was just a connecting stage from Murchison to the bottom of Mt Owen. A nice way to spin the legs out after a day on the river. Stage 8 –Mt Owen trek. We were convinced we’d be doing this at night. If we were lucky we thought we’d get an hour or 2 of daylight. We had sort of agreed that this would be the stage where we would have to get serious, so to speak. We had been jipped a bit by the dark zone, and were now in about 16th position. We had some daylight and we were all feeling really good, so we went for it. Em set a great pace up Sunrise Ridge and before we knew it we were pulling in teams that had left about 40 minutes before us. Em has an incredible capacity to chat and walk, and she didn’t let us down here. We passed a couple of teams and then ended up on the tops at the same time as the Australian’s of Team Adventure Addicts. From here it was tricky route finding, there were cairns, but they were hard to see at times, and often there were big rock crevasses in the way. It was an incredible spot to explore and the late afternoon was an amazing time to be up there. We kept saying how grateful we were that it was still light. We continued pushing as much as we could along the tops anxious to make the most of the daylight, and we were treated to a beautiful sunset just before the summit. From here, it was really tricky route finding. The Australians seemed to find a second wind and stayed on our heels for most of the trek, only stopping to make sure we were safe from the wild animals when we sat down to eat a meal. We essentially treated them to a guided tour of Lookout Range. I really enjoyed this stage, helping route find and pick out trails in the overgrown bush. It’s something I don’t usually get to do. We caught up to Team Motueka, and then we caught Team Old and Slow. Unfortunately, given the nature of the terrain and everyone having head-torches on screaming ‘here I am’, whoever was out front was essentially guiding the rest of the teams along. There wasn’t really any way you could get ahead, as it takes time to find a trail and by the time it’s located, the next team can follow you. It was quite frustrating, but once I accepted this I enjoyed the company of the others. On this stage, La’s feet became increasingly painful. 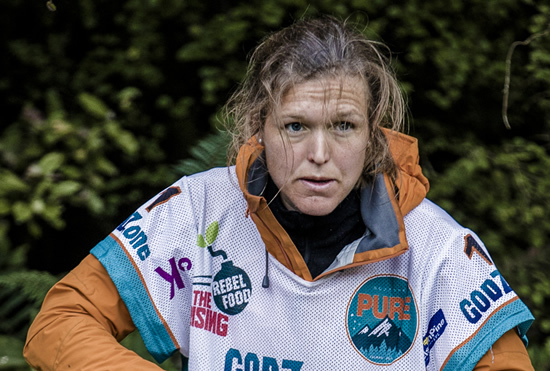 She took her socks off to put some Antichafe on, and I was alarmed to see that she had a case of the horrid Costa Rican foot infection that saw us pull out of the Adventure Race World Champs in 2013. We stopped a couple of times on the hike so she could put on some more antifungal cream, but despite this, her feet became worse. We came out of the lookout range into the forestry roads as the sun came up. La was in a lot of pain by this stage, walking with 2 sticks she’d picked up out of the forest but suffering without a word of complaint. We were close to the TA, with 3 other teams, and with only a straight forward bike and fairly short paddle to go. Neither stages which particularly suited our strengths. La checked the map and we set off down the road with the Aussies making a break for it in front….dirty underarm bowling Aussies! Then they turned and came back to us. Things were not adding up again. It was almost ‘mysterious’. The infuriating forestry roads had tricked us. Teams Old and Slow and Motueka had disappeared, presumably on the right road. Together with the Aussies, we went back to where we’d come out of the bush track and started again. A simple mistake, a small lapse in concentration that cost us an hour. The worst bit was that La was hobbling badly by now and she definitely didn’t need all this extra walking. Just before TA, the Aussies discovered a somewhat abandoned house bus that looked too good to pass by, so they stopped in for an early morning snooze. TA 8 –Mountain Bike. Totaranui. We had a slow TA here, giving Lara time to get her feet treated. They were in a really bad way now. In retrospect, we spent too long here, but it’s easy to say that now, I think we were all a bit annoyed that we’d spent all night with the other teams and they’d just gapped us. Once on the bikes, we were all battling a little bit with sleep monster, so we tried to yell at each other until we made it to Tapawera where an emergency café stop was in order. We were delighted to have a coffee to wash down a couple of No-Doze each and a vast selection of cabinet food to indulge in. This stop cost us about 20 minutes, but it set us up for the rest of the ride. We biked steadily down the valley, making the most of the free apples and free water just out of Brooklyn. Takaka Hill was a bit of a grind, but once at the top, it got much harder. The steep and loose surface made for some tough climbs. We were pleased to get to Canaan Downs and were looking forward to the Rameka Track. 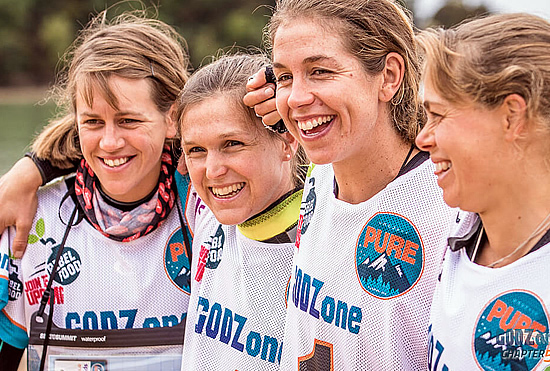 In my years of Adventure Racing, my views of fun mountain-biking during a race have changed. I’m the proud owner of a lovely full-suspension Rocky Mountain, but 3 days into a race I prefer riding it on roads. The more hot-mix the better. Generally, I don’t enjoy technical single track riding. By the time it comes along, I’m usually sleep deprived and lose all sense of balance. I’m tired and can’t find the physical oomph required to get over rocks and roots, and the last thing you need is a crash in the late stages of a race, so you end up riding conservatively which often makes it worse. Unfortunately the Rameka was exactly this. Added to, by the fact that Lara was in so much pain with her feet, every time she rode over a tree root, it was agonising. This was probably the low point of the race for me. I was so pleased to be off the single track and back on to a good road. And even happier when the road became sealed. Again, the support here was incredible, with people out on the streets everywhere. 140km later we were rolling into Totaranui Beach. We were in 10th position and we were keen to get home to a hot shower. We were in TA when Team Sneaky Weasels arrived about 15 minutes later. It was a bit disappointing actually, as we knew that it was unlikely we’d be able to hold them off on a 5 hour paddle. We got onto the water as the sun was going down, and the water was like glass. It was a beautiful evening, the sky absolutely full of stars. We paddled steadily, Fleur and Em talking non-stop to keep the sleep monster at bay. We pulled into Mosquito Bay to clip a CP a little too early, and ended up in the wrong bay. Unfortunately, this was enough to let the Weasels past and then they were gone. We spent the rest of the paddle admiring the night sky and discussing the highlights and lowlights of the previous 4 days. And so it was, we paddled up onto Kaiteriteri Beach about 10.30pm to a small crowd of friends and family. A huge thanks to our sponsors, Seagate, Torpedo 7, SYTA Magazine and Innov8 shoes.